3) NEW FOR 2018 – FULL REFUNDS. If you change your mind between now & next March we’ll refund you in full, no questions asked. 2017… How much fun was that? Want some more? Join us next year 6th – 8th of July 2017. Tickets on sale NOW & if you book early you can save over £20 on a 3day ticket. Get them at 20% OFF. But only until the end of the month. See below. – Save over £20 on a 3day ticket. Reserve your ticket for £20 & then simply pay the balance anytime between now & May 1st 2017 & get them at 2017 prices. (See below). 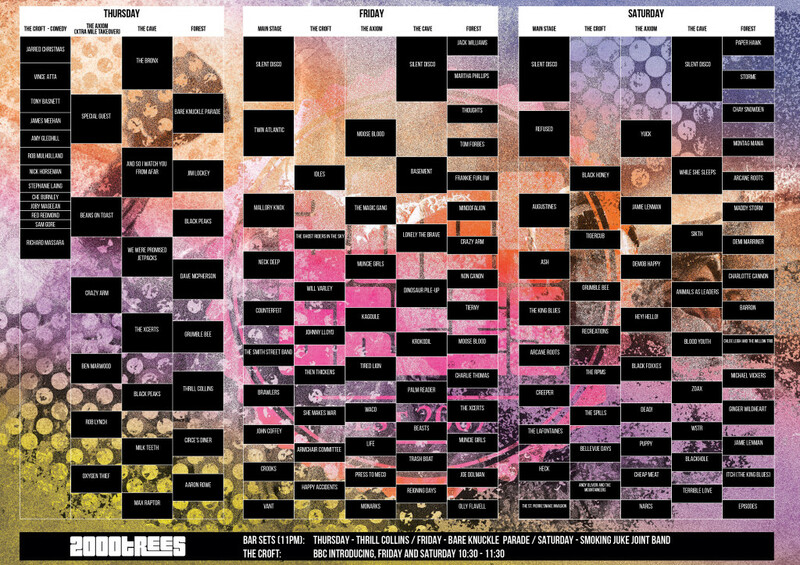 Day splits poster & clash finder below (click the clash finder to get the PDF version). If you want to catch all the action please be advised that 3day tickets are very nearly SOLD OUT… Click HERE for your tickets before it’s too late. (For serious). You’ve only got 52 weekends a year, make sure 7th-9th July counts! Ladies & gentlemen, may we present to you our 2016 line up... Get your tickets TODAY if you want to join the party. Tickets are very nearly all sold out, so you need to get yours TODAY. To sweeten the deal, to be in with a shot of winning £100 bar tab simply SHARE our poster above on Facebook (click here) & then, in the comments section, tag a few mates who you want to come with you. Do that before bank holiday Monday & we’ll pick a lucky duck to win £100 in glorious beer. GO. 1 – All the changes we’ve got planned for year 10. 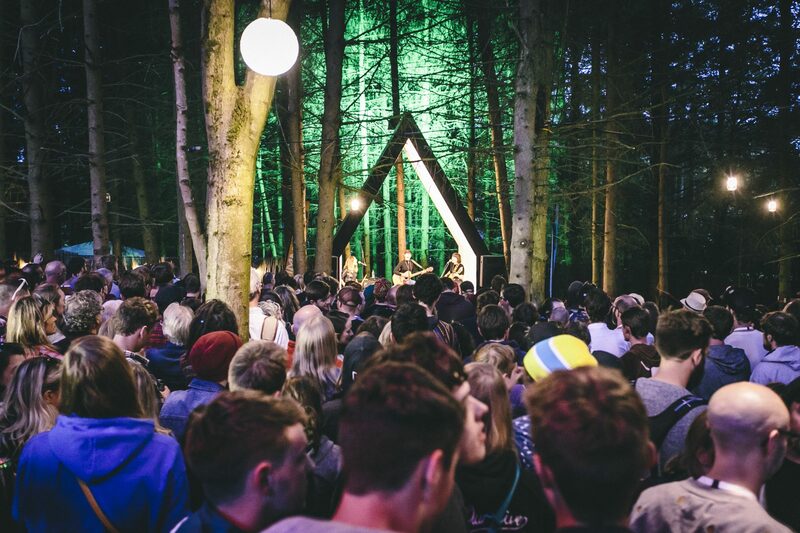 2 – Final band announcement dates for your diary (including our Forest sessions acoustic sets). 3 – Name our new stage & WIN a TICKET FOR LIFE. Hola hope you’re all well? Probably the biggest change to the site this year is that we are moving The Croft stage & bar. 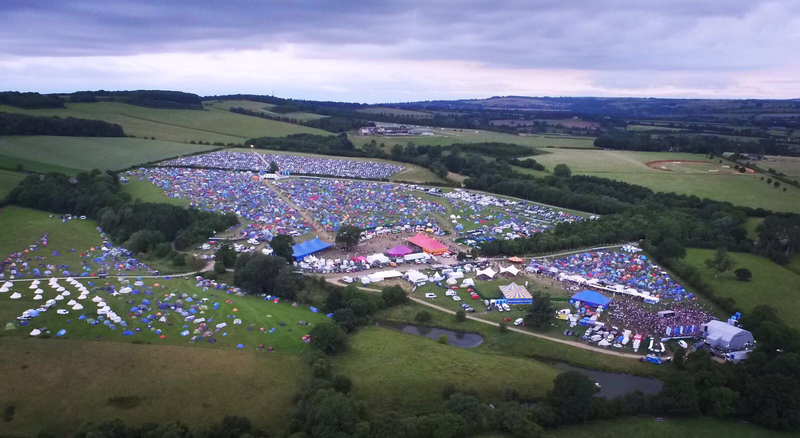 Instead of them being right up on top of the hill, we’ve decided to move them all the way down into the campsite by the main arena. 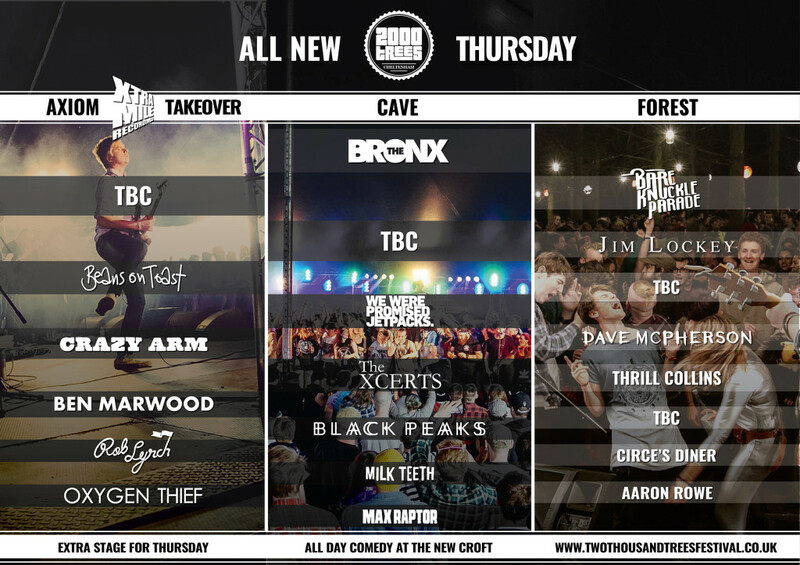 Mostly this is because it was quite a long walk uphill, but also we don’t want you to miss all the amazing bands (& Thursday comedians) on there – so now there’s no excuse. This way you can watch a band on the main stage, then within 2 minutes walk (via the bar), be sat out in front of our new stage, with a cold pint in your hand all before the next band takes to the stage. Whoop whoop. – For the 1st time The Axiom will be open on the Thursday. 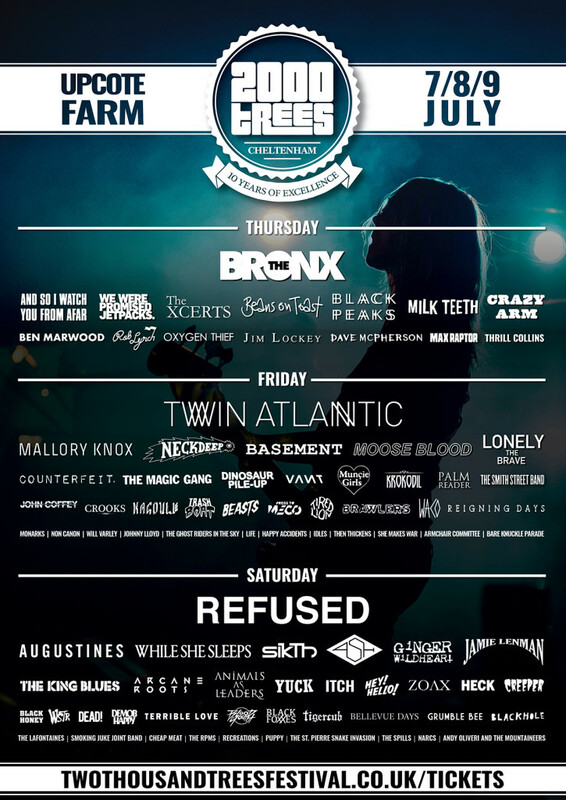 This means we can give you 120+ bands over 3 days, more than ever before. 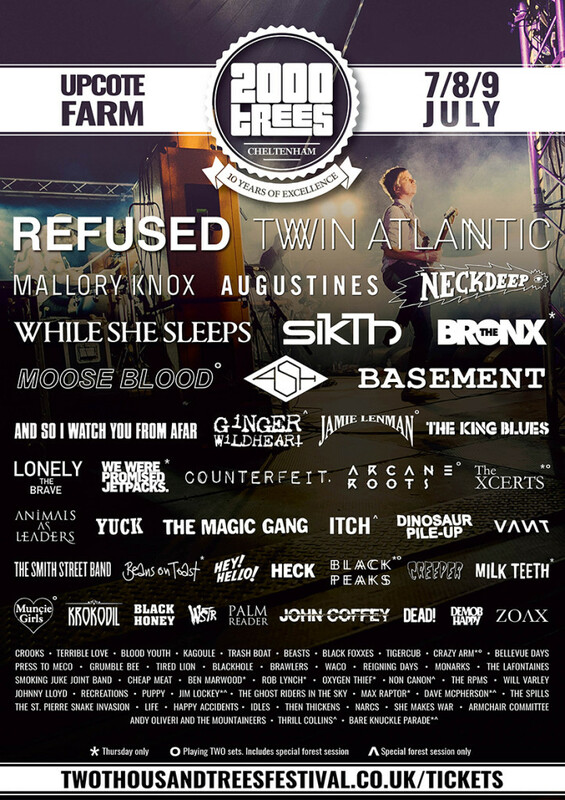 So now 2000trees gives you even more bang for your buck. – Forest acoustic sets. This year we’ve asked even more of our amazing bands playing elsewhere on the bill to do extra special Forest acoustic sessions. We’re really excited about who we’ve got lined up for these performances & as there is limited capacity in The Forest, these should be amazing & intimate sets not to be missed. – This year we’ve got even more food traders, including a chicken shack, a risotto stall, a brand new pizza joint, The Cheese Truck & another veggie vegan option to keep you veggie/vegans topped up with vegetables. 🙂 (Separate news post coming soon on all our foodies). Next Monday 23/5/16 = Forest acoustic sessions, FINAL bands & FINAL line up poster. It’s looking like all our tickets will be sold out by mid June so if you want one get on the case asap. That’s right, Buy Now Pay Later tickets have totally SOLD OUT & our remaining tickets are getting seriously low. Click HERE to get one of our remaining tickets before it’s too late. Thursday tickets are very nearly sold out, so if you want to be there for the full 3 days, pick the best camp spots & be among the first to wish us a happy 10th birthday then get your tickets post haste. Don’t say we didn’t warn you. – Buy Now Pay Later Tickets SOLD OUT… 3day tickets not far behind. In recognition of our 10th anniversary, this year’s fancy dress theme (as voted by you) is… “What you wanted to be when you were 10”. 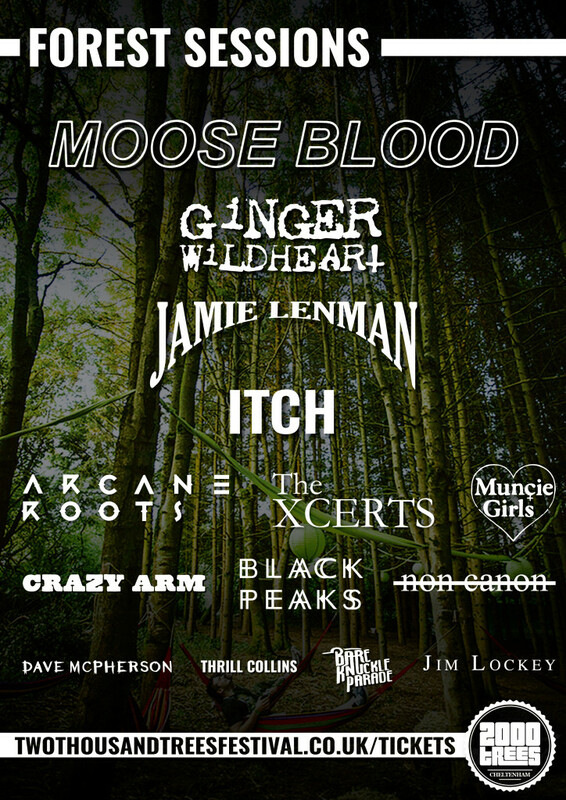 In other news… We have 10 super special Forest acoustic slots left to book… So, which 10 bands from our line up should we get to do an extra acoustic set in the forest? We can’t promise anything, but why not suggest & vote for who you want to see HERE via FACEBOOK & we’ll try & make them happen. 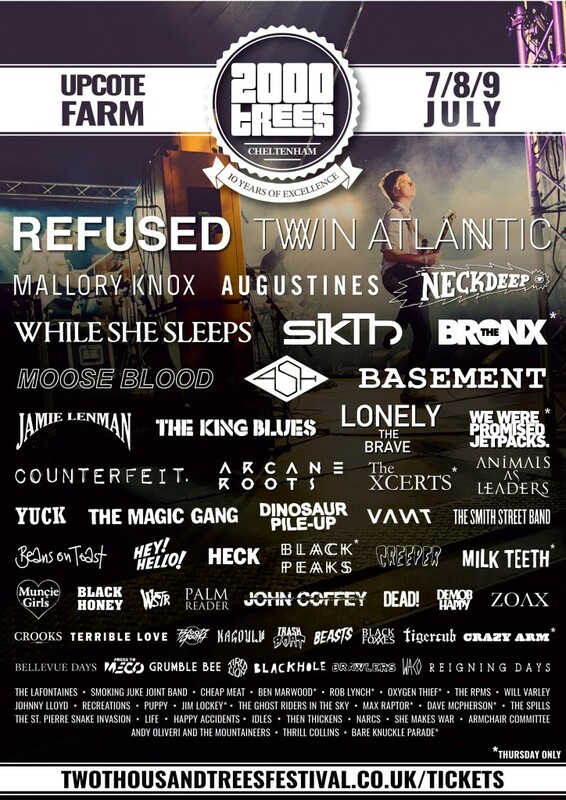 Augustines, Ash, Jamie Lenman, Sikth, Vant, The LaFontaines, Hey! Hello!, Smoking Juke Joint Band, & Cheap Meat. Don’t forget that last week we also added 10 of the best from Xtra Mile recordings; Beans on Toast, Crazy Arm, Ben Marwood, Rob Lynch, Oxygen Thief, The RPMs, Will Varley, Johnny Lloyd and Recreations. We’re over the moon to let you know that this year we’ve decided to open up another stage on the Thursday, The Axiom, so we can give you even more bands. What’s more we’ve given the whole day on The Axiom to our good friends at Xtra Mile recordings to curate. 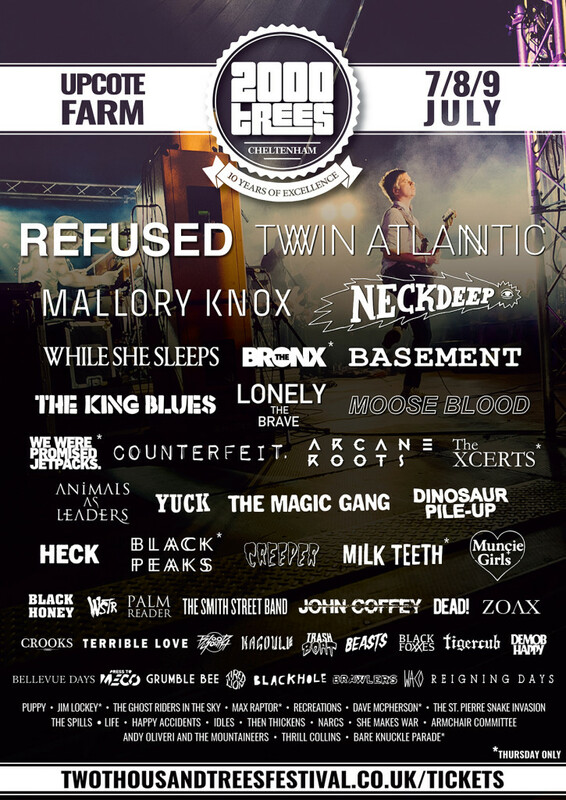 Check out the additions below, the cream of the crop from Xtra Mile’s stable & one more still to be announced.